Corrosion Inhibitors Market size for 2015 was close to USD 6 billion, and is anticipated to grow at over 4.9% CAGR. Robust growth in the construction industry across the globe is analyzed to be the prime factor propelling the global corrosion inhibitors market size over the forecast timeframe. The product is widely used in coating construction materials such as steel & steel bars, bolts & nuts and metal components. The product helps in increasing the product life and durability, as its application helps the material against corrosion caused by atmospheric moisture and harsh climatic conditions. Furthermore, in 2015, the global construction investment was roughly around USD 7 trillion and shall surpass USD 13 trillion over the estimated timeframe. This trend will substantially boost the business growth by 2023. The product is an essential raw material for water treatment chemicals. Increasing water treatment chemicals demand on account to depleting clean water sources due to rapid industrialization will drive the global corrosion inhibitors market size over the projected timeframe. The overall water treatment chemicals industry is forecast to exceed USD 30 billion over the projected period. This will subsequently result in industry expansion. Furthermore, rising clean water demand from industries including electronics, chemicals and medical will further complement industry growth. The global corrosion inhibitors market size is sternly directed and regulated by environmental regulations, precisely regarding its disposal and exposure to human. For instance, increasing product usage results in disposal of harmful raw material used in the industry such as chromium, zinc and phosphorous. This is anticipated to hinder the global business growth by 2023. However, the industry players are engaged in commercialization and R&D of environment friendly products, this will create new growth prospects for the industry. In 2015, organic corrosion inhibitors market size dominated the global industry and shall also further to witness maximum growth over the projected timeframe. Organic amines, benzotriazole, phosphonates, tolyltriazole and mercaptobenzothiazole are the major organic products used in the industry owing to their superior characteristics including stability. Furthermore, rising concerns regarding inorganic product owing to its associated adverse effects on the environment will consequently contribute to the segment growth by 2023. Inorganic corrosion inhibitors market size is analyzed to witness moderate gains more than 3% CAGR over the projected timeframe. The inorganic industry can be segregated as anodic and cathodic products based on its action mechanism on metals such as magnesium, zinc and nickel. The product is widely used owing to its higher stability in harsh climatic conditions. Corrosion inhibitors market size for water based dominated the global industry in 2015. The industry growth for the segment is primarily driven by growing water treatment chemicals need. Furthermore, growing industries including refining, construction, mining and power generation is likely to positively influence the global industry growth over the projected timeframe. The corrosion inhibitors market size for overall oil/solvent is forecast to observe growth more than 4% by 2023. The oil/solvent based applications involve copper, steel, zinc, aluminum cast iron, and alloys. Oil/solvent based coatings provide reliable performance over the prolonged duration owing to boost industry growth by 2023. However, the application has limited spectrum while operating across closed systems as it possesses higher flammability characteristics, which may negatively influence demand. The global corrosion inhibitors market size for power generation was valued close to USD 1.5 billion in 2015. The product is extensively used across equipment used in power generation such as gas turbines, switch gears, pumps and electronics components. Growing population across the globe results in the increasing energy demand. This trend will boost the overall industry for power generation end-use. The overall corrosion inhibitors market size for oil & gas is forecast to witness gains more than 5.5% CAGR over the projected timeframe. Escalating oil & gas industry will subsequently drive the global industry growth by 2023. The product finds widespread application the industry as it components used in the oil & gas exploration are exposed to extreme climatic conditions and requires protection against corrosion. Furthermore, shale gas exploration in the U.S. and Russia will complement business growth by 2023. In 2015, North America, led by the U.S. corrosion inhibitors market size was valued roughly around USD 1.5 billion. Positive outlook from the regional construction industry post 2008 economic turmoil is one among the major factor contributing business growth. Furthermore, robust oil & gas industry in the U.S. will propel product demand by 2023. Asia Pacific, led by India and China, dominated the global corrosion inhibitors market size in 2015 and shall witness highest gains over the projected timeframe. The regional growth is particularly attributed to increasing construction spending for commercial and residential projects. In addition, increasing government investment towards improving their public infrastructure will further complement regional business growth by 2023. 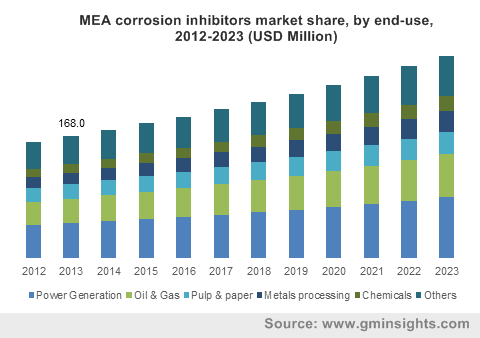 The global corrosion inhibitors market size was moderately consolidated in 2015 with major industry players including BASF, Ecolab, GE and Ashland comprising for less than half of the total share. Some other significant industry share contributors include DuPont, Dow, AkzoNobel, Champion Technologies, Daubert, Lubrizol, Eastman, Cytec, Dai-Ichi, Henkel, Halox and Cortec. These industry players are extensively involved in strategic growth activities such as capacity expansion, acquisitions & mergers and new product development in order to expand their global presence. Strong growth in the construction industry is the major factor propelling the overall corrosion inhibitors industry size over the projected timeframe. Increasing product demand as an essential raw material for water treatment chemicals will complement industry growth by 2023. However, harmful adverse effects related with the product makes the industry strictly directed and regulating by government regulations owing to obstruct the overall business growth over the estimated period. Nevertheless, R&D conducted by the industry players has brought up ecofriendly or green corrosion inhibitors products and has created new growth avenues for the industry. Asia Pacific dominated the global corrosion inhibitors industry size on account of increasing product demand from end-user industries such as construction.